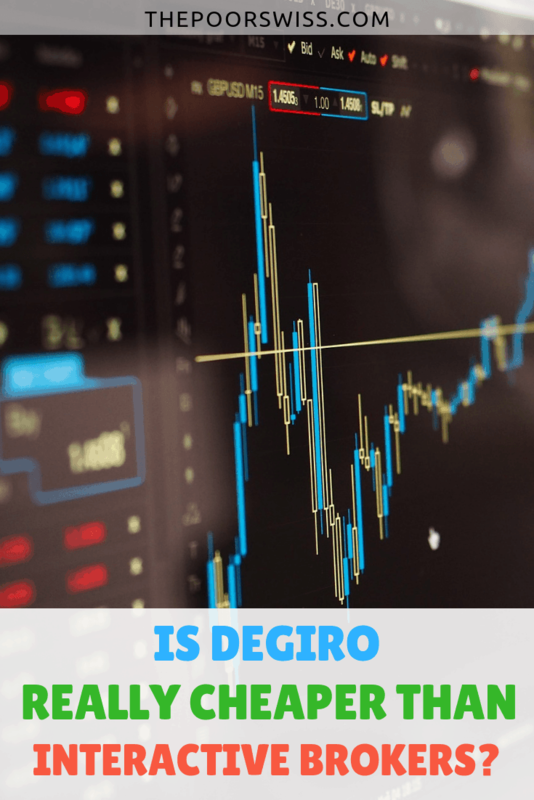 Home » Investing » Is DEGIRO really cheaper than Interactive Brokers? As a reminder, DEGIRO is a Dutch brokerage company. It is a quite new company. They only started in 2008 and only opened to the public in 2013. Even though DEGIRO is a Dutch broker, it is now available to many countries, including Switzerland. It is probably the cheapest broker in Europe, if not in the world. And they are growing really fast. If you want more information, you can take a look at my review of DEGIRO. As mentioned several times on this blog, DEGIRO is my broker of choice. The reason is simple: it is the cheapest broker. Period. You are probably surprised by the 0 CHF fee for US ETF. This is because DEGIRO is offering a large free list including the Vanguard funds that I am using. For instance, you have the Vanguard S&P 500 and the Vanguard Total World (VT). If you do not use one of the free ETFs, you will pay exactly the same fee as for Swiss ETFs. There is also a 2.5 EUR fee per year for each exchange on which you have positions. This is called the connectivity fee. Now, there is something very important to take into consideration. There are two kinds of accounts: Basic or Custody. If you opt with the Basic account, you will not get any other fees. But DEGIRO will be able to lend your shares to other people. If you opt for the Custody account, DEGIRO cannot lend your shares. They are yours only. However, the Custody account has some extra fee. You will have to pay fees on dividends. You will pay 1 EUR + 3% of the dividend, with a maximum of 10% of the dividend. Since I do not want my shares to be lent to anyone, I opted for the Custody account. At that time, I did not pay too much attention to this fee because I considered it, wrongly, negligible. In this post, I am are going to compare both account types. Interactive Brokers is a broker from the United States. It has been established forty years ago. And it is now the biggest online broker in the United States. It is used a lot in the personal finance community. It is a great broker also with very low fees. I do not have anything against Interactive Brokers. In fact, when I chose my broker, I almost went with IB but decided to go to DEGIRO to save on fees. Buy a US ETF: 0.005 USD per share, with a minimum of 1 USD (1 CHF) and a maximum of 1% of the value. This can easily be simplified to 10 CHF for a Swiss ETF and 1 CHF for a US ETF. For simple investors like us, we will hit the minimum in most cases. But there is one more fee that we have to take into account. Indeed, Interactive Brokers has a custody fee of 10 USD (10 CHF) per month. If you do not spend 10 CHF in trade fees, you will pay 10 CHF this month minus the fees you already paid. This is a big deal for small investors like us. However, as soon as you reach 100’000 USD value, they waive this fee! Something is very important for our comparison: By default, Interactive Brokers does not lend your shares to anyone. Now, we have all the information we need to compare both brokers! I am going to compare both brokers with several different scenarios. The first scenario is for a starting investor like me. Starting with 50’000 CHF (or USD, the same thing at the time of this writing) and investing 1000 per month. 1000 is invested in Swiss ETF every four months and the other months, invested in US ETF. The entire portfolio has around 25% Swiss stocks and 75% US stocks. It has a dividend yield of 1.8% which is around the average on the world stocks. And dividends are paid at the end of every quarter. These are reasonable assumptions for a starting investor. And for the sake of math, we are going to ignore that your portfolio can go up and down because of market valuations. DEGIRO is the clear winner here, as expected. But what this is also showing is that DEGIRO custody fees are not negligible. I was thinking it was not so expensive as that. I was thinking that 3% of the dividends was not a lot. But it is a lot more than I thought. And this is for a very small portfolio! It is interesting that DEGIRO fees went up 2 CHF while DEGIRO Custody Fees went up by 10 CHF! And Interactive Brokers fees did not move which is logical since the custody fees act as a minimum fee. For a starting investor, with less than 100’000 CHF in his account, DEGIRO is much cheaper than Interactive Brokers. Even DEGIRO Custody is cheaper than IB. Let’s now explore the case with a bit more money. We still have the same pattern of investment. But the invested value starts at 100’000 CHF and 2000 CHF are invested each month. This is very interesting! Interactive Brokers become much cheaper now that you do not have to pay custody fees! And it is cheaper than DEGIRO Custody. About twice cheaper! DEGIRO Basic remains very cheap, more than twice cheaper than IB. Let’s see what happens with 5000 invested each month. Only DEGIRO fees changed. This is because we are still hitting the minimum fees for a transaction from Interactive Brokers. For a standard investor with about 100’000 CHF of value invested, it is better to either go with DEGIRO Basic or Interactive Brokers. It depends if you want to take the risk of lending your shares. We can now see what happens for an investor on the road the Financial Independence (FI). 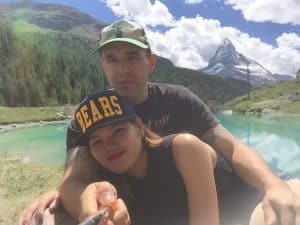 This investor has 500’000 CHF and is investing 5000 CHF each month. DEGIRO Basic and Interactive Brokers fees did not change. But DEGIRO Custody fees have grown very high! With a high net worth, it is a very bad idea to use DEGIRO Custody. Let’s see the last example: An investor that reached FI at one million CHF. Let’s say that he can still invest 1000 CHF per month via a side hustle or some passive income. The results are pretty clear! The financially-independent investor will lose 561 CHF each year because of DEGIRO custody fees! Once again, DEGIRO Custody is a very bad choice for a large net worth. This is not an acceptable fee for someone who is financially independent. And taking the risk of your shares being lent when you are entirely dependent on these shares is probably not very reasonable either. So Interactive Brokers is probably the best option here. We have seen that Interactive Brokers is really bad for a value of less than 100’000 CHF. And we have also seen that DEGIRO Custody is really bad for a large value. But DEGIRO Basic is really cheap. First of all, we see that using Custody account for CH positions is quickly becoming too expensive. However, if you are willing to risk the share lending of DEGIRO for your CH positions, this could be worth it to have a DEGIRO Basic account for your Swiss positions and an IB account for your US positions. I think this is a really interesting solution. It is also one layer of protection if one of the two brokers goes bankrupt. In most cases, you will get back your money. But it can take a long time. So if you have two brokers, you can still access the money from one while the other is in jeopardy. For now, I am far from having 100’000 CHF on my portfolio. So I do not have that problem yet. But I am really thinking of moving my US portfolio to Interactive Brokers once it reaches 100’000 CHF. And also moving my CH portfolio to DEGIRO Basic account. I do not have to take the decision now. But I will think about it and take the decision before I reach that point. There are a few important things about these two brokers. DEGIRO Custody is not as cheap as it seems and can easily end up being way more expensive than Interactive Brokers. As expected, Interactive Brokers is too expensive for small net worth because of its safe custody fees below 100K CHF. DEGIRO Basic is indeed the cheapest. But you take the risk of lending your shares. If you do not want your shares to be lent and have less than 100’000 CHF. Once again, the answer is easy, you should use DEGIRO Custody account. Interactive Brokers is really too expensive for portfolio below 100’000 CHF. If you do not want all your shares to be lent. But you can afford the risk on some of your shares. In that particular, you may want to consider using DEGIRO for your Swiss shares and Interactive Brokers for your US shares. Somebody may think that it is not fair to compare DEGIRO Custody and Interactive Brokers (IB). Because DEGIRO Basic is cheaper, one should compare it against IB. But this is wrong. It is a fair comparison because neither of them is lending your shares. In fact, IB has an option to allow them to lend your shares. In which case, you are getting half of the benefits. That means that IB with this option will be even cheaper! For now, I do not plan of changing Broker. I am still quite satisfied with DEGIRO. But when I will reach 100’000 of my US positions, I may consider switching them to Interactive Brokers. We will see about that. I still have a long way to go before that point. What do you think? Do you prefer Interactive Brokers or DEGIRO? What broker do you use? Good article. But you made the same “mistake” than MP on his blogs when he compared brokers. IB has even lower commissions fees if you use the Tiered Pricing Structure. It’s less predictable but usually cheaper than the Fixed rates. (Some on Mustachian Post talked about it, check on the forums). I’m paying the minimum when I buy US stocks, aka USD 0.35. (Yes 35 cents, compared to the 20-50 bucks I would pay on swiss brokers, it’s literally 100x times cheaper!). That’s almost a third of what I would pay in Fixed tier. And since I mostly invest in the US and don’t invest in Switzerland except via my 3a, IB is far better in my case. I’m not sure people like to move of brokers when they have a big portfolio (>100k USD) especially in the FIRE community. Seeing all the posts on Mustachian Post with people stuck on other brokers and complaining about the fees of moving their portfolio to IB or something else or are afraid of too lazy to switch. IMO better do it right now and being done. Same with people having 3a stucked on some bad providers and aren’t willing or can’t switch “costlessly” to VIAC. You just have to accept to pay 10 USD (minus commissions fees you generated during the month) / month till you reach 100k. My Degiro account is empty and I won’t use it to invest, at least for now. You also have to ask yourself, how much swiss stocks allocation do you want compared to the rest of your US/World allocation ? The lower, the better it gets to have IB. The otherwise, on Degiro. My allocation of Swiss stocks in my investment portfolio is 20% for now. I know that a lot of people do not like changing brokers/insurance/banks/etc. Most of the time, it’s by laziness I think. I just wanted to let you know I have linked to this post in my own blog post about brokers. My post isn’t so much about price comparison and more how I experienced these brokers. I’m also not directly with IB but with a partner, Lynx, so it’s not a perfect fit but should give the people an idea. I read the comment above but since the tiered system is not done with Lynx (and the IB link doesn’t work?) your post should still hold true in general. I have gone through your post, also very interesting :) I did not know about Lynx. Yes, it should hold true for Lynx as well. But the updated post about Tiered pricing will come live tomorrow. It is really cheaper! What IB Link are you talking about? I get a Error 403 – Access Denied, which means I don’t have enough rights to access that page. I’m looking forward to the update. Then I can update my own post as well. Indeed it works. It got blocked by my company’s proxy :P I just didn’t get to see the company proxy warning for some reason ¯\_(ツ)_/¯. Yes, I have also a few websites blocked like this at work! But how about buying ETF’s that accumulate dividends? Then on DEGIRO you’ll pay only 2.5€/y and that’s it. That is a good idea! Indeed, you will not pay DEGIRO fees. Unfortunately, most of my ETFs are currently not available in accumulating version, at least not with the same TER. I should still consider accumulating ETFs more in the future if I continue using DEGIRO custody. And happy new year! Thanks for all your useful posts. Im currently deciding whether to use Interactive Brokers or DeGiro. I was attracted by the low cost fee structure of DG while building my stash up to 100k, especially the selection of ETFs that can be traded for free once a month. However, an updated ETF list from DG shows that a wide range of Vanguard funds have disappeared from this list such as VT, and only tradeable in EUR as currency (https://www.degiro.ch/data/pdf/ch-en/Free_ETFs.pdf). Since you have VT as part of your portfolio, do you have any comments on this? VT has been removed from the list quite a while ago. However, for me it has always been free. I still bought it last month for free. I do not know if this will stay like this though. However, for a few days, I have not been able to buy VT and VOO ETFs on DEGIRO. The application tells me that the product is closed for me. I do not know what that means exactly. I have sent a mail to their support, but have not received an answer yet. I am a bit afraid that they stop offering these ETFs altogether. If that is the case, I will be sure to post on the blog. And I will migrate away to IB. If I were you, I would wait a bit before opening a DEGIRO account. Thanks for your informative post. I also have a Degiro Custody account but not much invested there (less than 15 K CHF mostly in VT). But since some time now I am unable to buy VT through Degiro but read online that its still possible via IB, though only till end of 2019 it seems. Hence was thinking of opening a IB account as well. I guess you should also not be able to buy VT or other Vanguard ETFs anymore via Degiro. Does this change the whole discussion about Degiro vs IB? Yes, it does change the whole discussion, unfortunately. I wrote about the fact that we are going to lose access to U.S. ETFs. I personally am moving to Interactive Brokers. But I am expecting to reach about 100K early next year, so they will waive the 120 CHF per year. If you are thinking you are going to be more than 100K CHF soon, you should probably move to Interactive Brokers. If you do not think you can make to 100K soon, you can stay with DEGIRO. But that means you are going to need to use European ETFs. They are fine but have higher fees.